Members are taken to and from their yachts throughout the season by two launches that are for the use of our members and their guests. Visiting yachtsmen are also welcome to use this service and will be charged per trip. 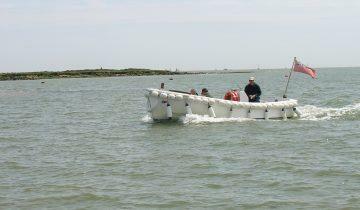 The launches run from a floating pontoon from which dinghies can also be launched at all states of the tide. Fresh drinking water is available from a standpipe on the end of the pontoon. A second mooring pontoon has been installed in Ray Channel, only about 200 meters from the landing jetty. This will provide additional moorings for the benefit of members and visitors, subject to availability at the time of arrival. The operating hours of the Club’s launch service have also been extended. From April 19th to September 29th the launch service will now operate until 2300 hrs on Fridays and Saturdays and 2100 hrs on Sundays. We welcome all visiting yachtspeople in the Club to enjoy the new chef’s menu and socialise in the bar without having to worry about how you will get back to your boat. The Club’s launch will take you within the hours specified above. Visiting (non WMYC Member) Yachtsmen and women will be charged £2 per head for a trip ashore in our Club launch, but on presentation of a WMYC till receipt showing purchases from the bar on that day, the return trip will be free of charge. Please Note! – The WMYC launches are white and fly a WMYC ensign.